STAY 4 NIGHTS AND WE'LL WAIVE THE CLEANING FEE! This warm and inviting 3 bedroom/1.75 bath cabin overlooks a small pond frequented by Moose and Elk. The country decor and wood-burning fireplace make this cabin a perfect place for a relaxing getaway. You’ll enjoy spending time on the large deck that overlooks the pond having a BBQ with friends and family, reading a good book or just listening to the peace and quiet. This cabin provides a combination of privacy and tranquility while also having the added convenience of being a short drive from town and Rocky Mountain National Park. Plenty of games and toys for the children and DVDs for all ages as well as books are also provided for your enjoyment. “Columbine Lake is a private, covenant-controlled community. Renters are not allowed to use the clubhouse, gazebo, horse pasture, OHVs or Columbine Lake.” Plan on using one of the other three lakes (Grand, Granby and Shadow Mountain) for all your lake activities.”. Keep in mind when booking, that this property is located in a quiet neighborhood with owner residents. Minimum Age Requirement to rent this home is 25. We were a party of 6 staying in beginning of December. The cabin was perfect for us. The kids had a blast playing in the snow on the deck and we could watch from the living room. The heaters and wood burning stove kept us warm and toasty. The property management team could not have been nicer or helped us anymore. They are really fabulous. Things I wish I would have known that where available are spices to cook with and plenty of fans. This was a perfect little cabin in the woods and covered all out needs wonderfully. Thanks for the great trip! So glad you enjoyed your stay. Come back and see us again. Happy Holidays! Had a great stay with my family. House was well stocked and in a great location to grand lake and Rocky Mountain national park! We're happy to hear you and your family enjoyed your stay. Moose Pond is in a great location. Great starting off point forRocky Mountain National Park! Hey Karen! So glad the wildlife cooperated and you had a great stay. Come back and see us again. Beautiful scenery, comfortable cabin, so vlose to the park entrance. Moose Pond is a wonderful place. Glad you enjoyed your stay. Had another peaceful stay at Moose Pond Cabin! So happy for you! Hope to see you again soon. Our stay here was amazing, very relaxing, abundant wildlife cozy home. Thanks Denise, the wildlife always seem to cooperate at Moose Pond! Had another awesome experience on Moose Pond. Experienced wild life and a very relaxing and clean cabin. We're glad you continue to enjoy Moose Pond. It's a special place. We look forward to seeing you again. perfect location only 5 min drive from Grand Lake entrance to RMNP. This side of park is less congested and has more wildlife sightings. We had a wonderful stay- just wish it was longer! We had a great stay. Place was wonderful and had everything we needed. Wonderful! We're glad you had a great sty. The back deck feeder. Cabin provided everything we needed for a comfotable stay. Would recommend an additional television in one of the bedrooms so guests wouldn't have to watch the same programming at night. July 21-24, 2018. Moose Pond Cabin was PERFECT! Very clean and very cozy and very nicely decorated. The kitchen had everything you would ever need in it. All you need is your clothes and food. The beds were soooo very comfortable. Love the deck and all the wildlife we seen. This cabin sits just outside of the Rocky Mountain National Park. Moose came to the pond about 6:30 am. We loved this cabin!! Also the staff with Grand Mountain Rentals are absolutely the best! Very caring and compassionate. There is no question about it, Moose Pond Cabin is where we will always stay. Thanks Tracy, we're happy everything went so well. Please come back and see us again. Wasnt sure if we were going to be allowed to stay since a wild fire caused an evacuation of the area. Thanks to a tremendous effort the fire was quickly extinquised and the vacation was fantastic. Yes! That was quite the experience and we are all grateful to our fire fighting team. We're so happy you were able to enjoy your vacation. This is the 4th time we have stayed at Moose Pond Cabin and we love it more each time! This visit we saw a mama moose and her baby in the backyard and also 2 other female moose. We also had a fox come visit. Moose Pond is such a peaceful place to stay. We enjoy sitting on the deck to play games and watch the animals. We intend to come back again! We look forward to seeing you again! I'm glad the wildlife was so cooperative! I rented here because I really wanted to see a moose and based on reviews, I thought I might have a pretty good chance. To my dismay no moose sightings anywhere. The cabin was woodsy. Very Clean and well stocked and very comfortable. The pond was beautiful. The only thing that could be better is the couch. It needed cleaned and had a sloppy loose cover over it. One queen bed was comfy, one not so. We had a lovely stay there. Moose Pond has the most perfect location in all of Grand Lake! When we werent revetted by our view of the beautiful and peaceful lake, we were enjoying this cozy cabin with its fabulous new kitchen and cozy rooms. Located in the Columbine neighborhood,we enjoyed being near the amenities of town AND the wonders of Rocky Mountain National Park! It is such a special property!! Our only concerns with this property have to do with safety. When returning to the property after dark, we found the uneven steps very difficult to manage because they were VERY dark. Solar lights would be SO helpful! As for the motion activated flood light, it was not much help.. It was not aimed at the walk AND we had to navigate the dark steps before tripping it. Also a rail to steady your guests on the steps as they bring luggage and supplies in and out would be fantastic! We hope youll consider these little tweaks because we love your cabin! Once again we had a fabulous stay at Moose Pond Cabin! Loved the newly updated kitchen as well. We didn't spend much time at the rental as we spend the majority of our time at the Rocky National Mountain Park. However, this property is the perfect location from the park and from town. We would gladly stay here again. The home was clean, and for the first time ever (while vacationing) we were provided with enough bath towels and wash cloths for our stay. Perfect girls weekend and we saw 2 huge moose right next to the patio! Will definitely book this cabin again! Nice house with deck overlooking pond. Saw mooses everyday plus other wildlife. Close to town. We enjoyed our stay at the Moose Pond Cabin. The management company was extremely helpful. We noticed a minor issue when we checked in, and they sent someone out within minutes to fix it. We watched hummingbirds on the deck, ducks on the pond, and saw a moose multiple times off the road to/from the cabin. You can't beat the location for day trips into RMNP. There were toys, games, and coloring books for the kids as well as kid friendly plates and cups. Overall, this was a great place to stay. We stayed in Moose Pond July 2017. The house was clean and spacious for our family of 6. We enjoyed watching the hummingbirds and the ducks in the pond. We did not see moose near the rental property. The house is a great location, near RMNP and near Grand Lake. Loved seeing on the deck watching the wildlife. We loved the location with pond view, we saw ducks daily in the pond and watched the many humming birds fly around the porch, and best of all we got to see moose in and around the pond several times! the house was clean and had most amenities needed, management was helpful and friendly (tip everything management suggested to eat, have coffee, etc. was the best, better than anything we picked, so take the locals advice:), location was very close to everything we wanted to do. Highly recommend especially if you are a large family more comfortable than a hotel, and a true mountain lake experience with a more home feel. The cottage is in good condition and has a new kitchen. Perfect setup for a family with children yet was nice for my wife and I. The drawbacks are the houses that are so close on each side and the pond is very shallow and something you want to fish or swim in. We had moose walk up to within 20 feet of the back deck each day we were there. Overall a very good experience. Perfect, quite location with clean accommodations. As always, we totally enjoyed our stay at Moose Pond Cabin. We keep coming back year after year and we're never disappointed! A lovely cabin in a wonderful location. Very clean and well equiped. Very happy you enjoyed you recent stay at Moose Pond. It is a very special cabin and the deck overlooking the pond is just an added bonus! Hope you get to come back next year! Very good. Good place to stay. So glad you enjoyed Moose Pond! Please come back again! Grand Lake is our families favorite mountain retreat. We have been enjoying Grand Lake for over 40 years! This was our first stay in the Columbine Lake area and Moose Pond did not disappoint. Our favorite spot was the deck area and we were very fortunate to be entertained by a mother moose and her baby on two afternoon/evenings! That was quite a treat for my 5 year old grandson. My only suggestion would be for better cookware. The frying pans had seen better days! We had a great experience with Grand Mountain Rentals. The house was cute & in a perfect location. We hadn't even unloaded our stuff when we saw a male moose in the pond. He got out and walked right behind the house. The deck was great and looked out directly over the pond. We were able to feed ducks & geese every day. The house was the perfect size for our family of four. Thank you for such a nice review! We are so happy you enjoyed Moose Pond. It is a very special cabin! Weve never been to Grand Lake and a friend recommended we stay in this cabin. We liked it because it was more isolated than a lot of the vacation homes in the area. The inside of the house is fine. Nothing fancy, but thats ok for a vacation home. It was just the 2 of us, but theres definitely enough room for another couple and a few kids. The living room windows and deck overlook the small, peaceful pond. The picture doesnt show you that there are 2 houses on both sides of the cabin. One of which is pretty close, but they were quiet so it wasnt a big deal. This cabin is in a beautiful location, was very clean, and had firewood readily available for the wood stove. The owners were friendly, and it was a great place to spend our Christmas. The only major flaw I found with this cabin was the beds. The queen was in the worst shape, but the full was also in need of replacement. They had no support, and left us very stiff and sore in the morning. Either the box spring or both mattress and box are in desperate need of replacement. Unfortunately I cannot recommend it to anyone, as that is a major flaw. Otherwise, it was a very cozy and inviting place to stay. Thank you for the nice review of Moose Pond. It is a special place. We are sorry you felt the queen mattress was uncomfortable. We have had no other complaints regarding this mattress and this home gets very positive feedback. Mattresses can really be a very personal preference. We are so glad you found the cabin cozy and inviting and had a nice Christimas staying there. Have a very happy New Year too! We did spot a moose, and the feeder brought a flock of birds to the terrace. A lovely, relaxing location. The cabin was well stocked with all our needs. I never dreamt I would see a moose that close, let alone a moose swim across the pond - twice. It was great to be on a deck so close to the water. The accommodations were perfect and we got everything we expected with the cabin. My brothers are ready to buy this cabin. We are so glad you enjoyed your stay at Moose Pond. It most definitely is a very special cabin. Come back and visit again! We still love the place just needs better maid service and TLC to keep up with some of the competition for the price that is charged. Moose Pond was perfect for our family getaway. There were 9 of us who stayed and there was plenty of room. The Cabin was clean and well maintained. Very quiet as it appeared we were the only ones around. We were able to see a Mother and baby moose in the pond one morning. great place to visit. Moose Pond is such a special cabin and we are so glad you enjoyed your stay. 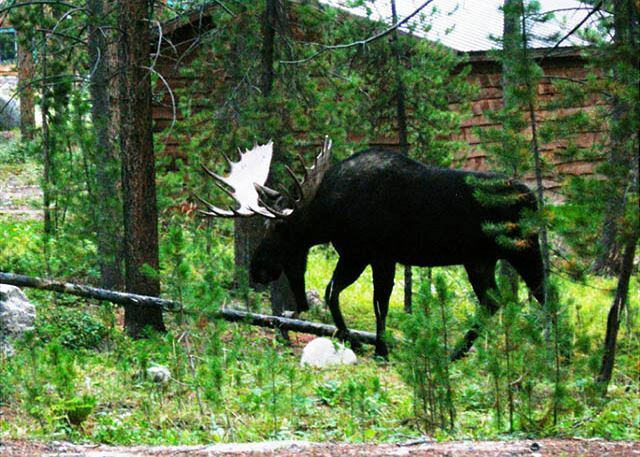 Glad you saw a mama moose with her baby right from the cabin! Please come back and stay with us again! We are so happy you enjoyed Moose Pond. It certainly is a peaceful and relaxing place. Wonderful for moose watching too! Come back and visit again! Had a wonderful stay with my children and grandchildren! The kids saw 4 moose and a moose baby. Loved Grand Lake and the Rocky Mtn National Park that are within a few minutes drive. We will be back for sure! So glad you had a good time in Grand Lake and the Rocky Mountain National Park! Moose Pond is such a special cabin and in the perfect location to experience everything our town and surroundings offer. We look forward to your return visit! Great and cozy family place to stay on vacation! We had wonderful time as always and appreciated the instant coffee that was at the cabin as we had forgotten ours, Also enjoyed the Fireworks over the lake on Saturday. My mom really loved the ducks visiting each day on the pond. No luck seeing any Moose this year. Also enjoyed strolling, shopping and having lunch in town everyone was very friendly. The leaves were beautiful this year! Thank You "Calise" for everything!! Hope to see you next year again! We loved the location and the beautiful deck. We watched ducks and river otter on the tranquil pond. The only thing that was difficult was the place smelled like cigarettes even though it is a non smoking cabin. We let the office know when we left, at first they were certain that wasn't the case however discovered another renter had been there since they had visited. There was no compensation for this and I felt like since I had signed a promise for this exact issue and they were so adamant about it they would have made some adjustment. My family and I had a great stay at the Moose Pond cabin, very convenient location to town and the park. Cabin was clean and well maintained but be advised there is NO INTERNET and cell service is spotty at best. Lots of wildlife right around the cabin at all different times of the day. On our next trip to Grand Lake I will definitely inquire about this cabin. We loved staying at Moose Pond and on the last day of our vacation, there were three bull moose on the pond!! Cabin was spacious and easily accomodated six. Great location - close to town and to RMNP. There is no dishwasher, but that wasn't a problem for us. Property Management staff were wonderful. I would definitely recommend this property!! Serene and beautiful scenery. Close to Rocky Mountain National Park and hiking trails.